To our son, who is 10 years old today, thank you for choosing us, and thank you for making our family complete. 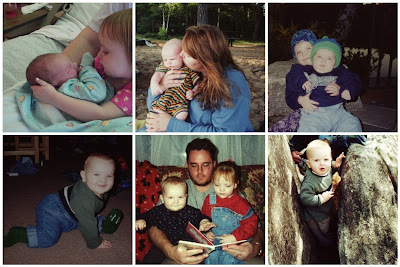 When your sister was born, it was beyond magic, beyond anything we could have imagined. We were happy and in love with her. When you were born, we were content. And in love and happy beyond measure. But you made us whole, finished. You closed the circle. When you were born, it was like we knew you already. "Yes", we said to ourselves, "here he is." You and your sister were old friends from the moment you laid eyes on each other. She was there, you know. At your birth. I know you've heard this story many times. She had her little sweet hands on my neck and shoulders, "push Mommy, push!" she said. And when she held you for the first time, it was "hi Adam" over and over again. Was that really ten years ago? Really? It doesn't seem possible that is. And then I look at you, and I see this tall, gentle, creative boy, always smiling, always ready with a hug and I think to myself, "yes, here he is." Happy Birthday, our baby, our boy, who made us whole. I have never posted on anyone's site before. I found your site purely by accident as I was exploring our family tree and typed in Amy Bradstreet. As a bonus, I stumbled on your blog. I am also an "unschooler"/life learning mom (three daughters) living in California though but found some many similarities. I really mainly wanted to say that your post for Adam's birthday touched me and brought tears to my eyes. It touched the mother in me and how I feel about my own children. So beautifully said---Thank you! Thanks, Tameka and Anet, I'll pass on your birthday wishes. Cory, thanks so much for your kind comments and for writing! Welcome and make yourself at home. So I take it you have Bradstreets in your family tree? My husband's family is descended from Simon and Anne Dudley Bradstreet. It's so wonderful to meet interesting folks via blogland--many thanks! happy birthday to adam!. what a lovely post. i have to say that this post brought tears to my eyes too! so much i recognise from our own little family.